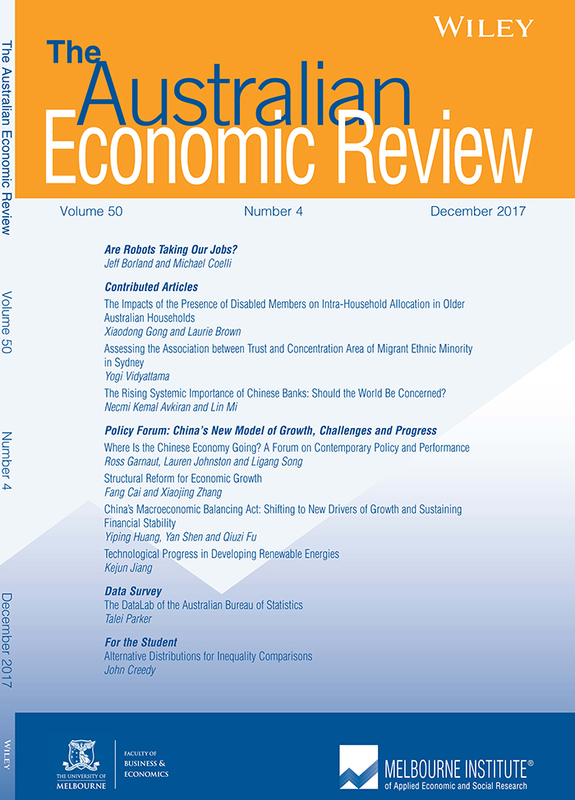 The latest edition of the Australian Economic Review explores the association between community trust and concentrations of migrant ethnic minority groups, the effect of robots on employment and the progress of China’s economy. Published quarterly by the Melbourne Institute, Applied Economic and Social Research at the University of Melbourne, the journal has a strong policy focus and presents research on and analysis of topics relevant to economic and social issues. Dr Yogi Vidyattama from the University of Canberra examines whether geographically concentrated migrant ethnic minority groups are associated with lower levels of trust in Sydney. Professor Jeff Borland and Dr Michael Coelli from the University of Melbourne explore the effect of computer-based technologies on employment in Australia. The researchers find technology does not decrease the amount of work available or increase the pace of structural change in the labour market. Dr Xiaodong Gong and Professor Laurie Brown from the University of Canberra explore the spending habits of older Australian families, particularly those that care for a member with a disability. Professor Ross Garnaut and Dr Lauren Johnston from the University of Melbourne and Associate Professor Ligang Song from Australian National University assess the progress made since China adopted a new model of growth in 2011.